ETATS-UNIS 1 Dollar 2017 – Eagle : Armageddon – 31,1 g Argent 999 BU (partiellement plaqué or) – 500 exemplaires seulement – diamètre 40,6 mm – prix observé 89,95 euros. Images Power Coin. 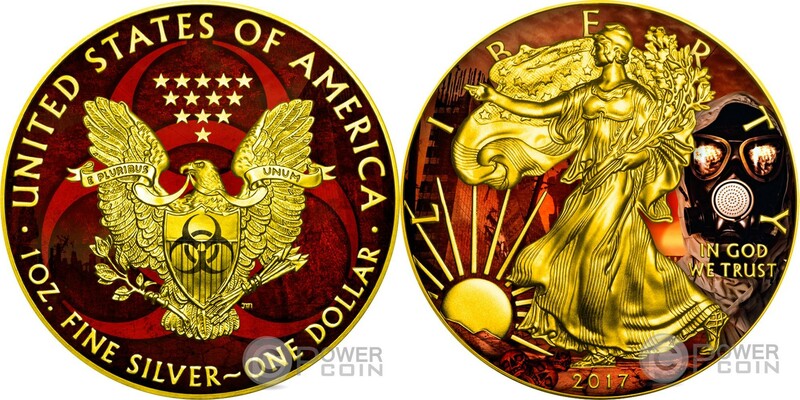 UNITED STATES 1 Dollar 2017 – Eagle : Armageddon – 1 oz 0.999 silver BU (partially gold plated) – mintage 500 pcs only – diameter 40.6 mm – observed price $97. Pictures Power Coin. NIUE 2 Dollars 2017 – Magnifiques villes : Copenhague – 31,1 g Argent 999 Proof – 3000 exemplaires – diamètre 40 mm – prix observé 79,95 euros. Images Power Coin. 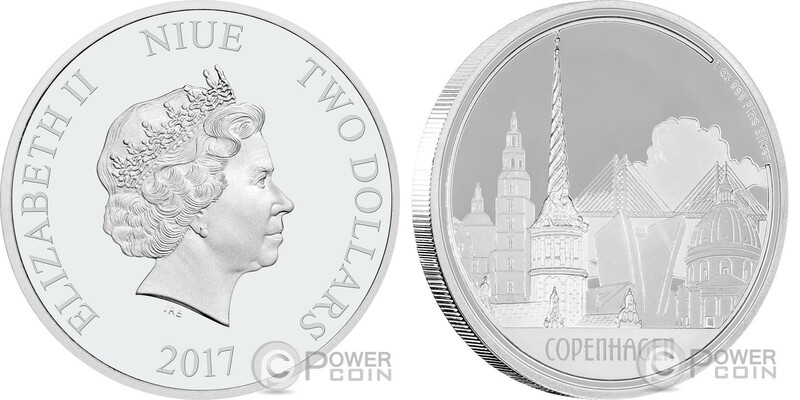 NIUE 2 Dollars 2017 – Great Cities : Copenhagen – 1 oz 0.999 silver Proof – mintage 3,000 – diameter 40 mm – observed price $86. Pictures Power Coin. CAMEROUN 1000 Francs CFA 2016 – 70 ans de l’ordination sacerdotale – 31,1 g Argent 999 Proof – 500 exemplaires seulement – diamètre 38,61 mm – prix 82 euros. 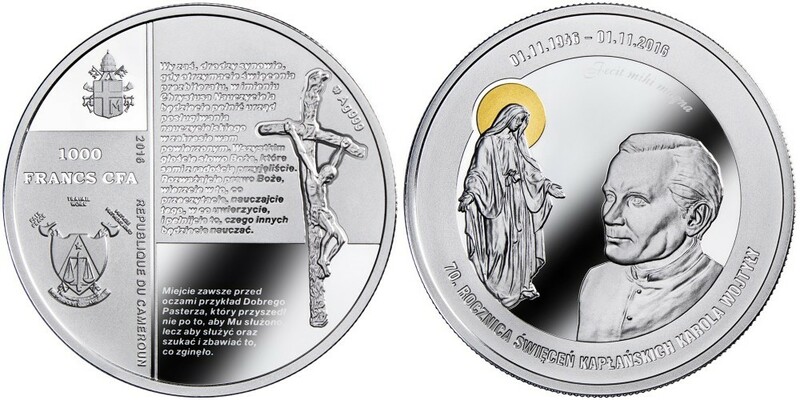 CAMEROON 1000 Francs CFA 2016 – 70th anniversary of the Priestly Ordination – 1 oz 0.999 silver Proof – mintage 500 pcs only – diameter 38.61 mm – price $88. CAMEROUN 100000 Francs CFA 2016 – 70 ans de l’ordination sacerdotale – 1 kg Argent 999 Proof – 70 exemplaires seulement – diamètre 100 mm – prix 2312 euros. 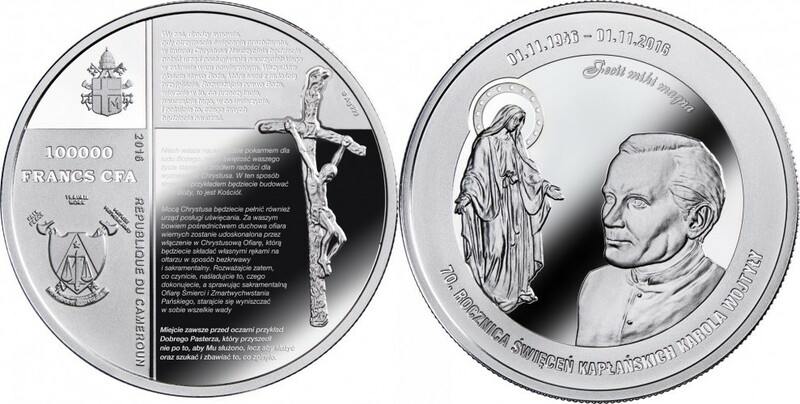 CAMEROON 100000 Francs CFA 2016 – 70th anniversary of the Priestly Ordination – 1 kg 0.999 silver Proof – mintage 70 pcs only – diameter 100 mm – price $2,498. NIUE 1 Dollar 2017 – Dzwon Zygmunt 500 ans – 31,1 g Argent 999 Proof – 500 exemplaires seulement – diamètre 38,61 mm – prix 91 euros. 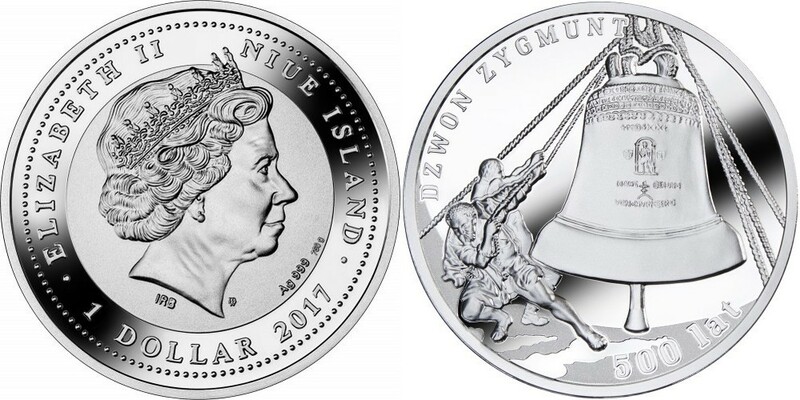 NIUE 1 Dollar 2017 – Dzwon Zygmunt 500 years – 1 oz 0.999 silver Proof – mintage 500 pcs only – diameter 38.61 mm – price $98. ILES COOK 2 x 1 Dollar 2017 – Skyline dollar : Kuala Lumpur & Singapour – 2 x 5 g Argent 999 Proof-like – 5000 exemplaires – taille 150 x 70 mm – prix ignoré. COOK ILS 1 x 1 Dollar 2017 – Skyline dollar : Kuala Lumpur & Singapour – 2 x 5 g 0.999 silver Proof-like – mintage 5,000 – size 150 x 70 mm – unknown price. FIDJI 10 Dollars 2017 – Mandala art : dragon chinois – 93,3 g Argent 999 finition antique (avec un rubis inséré) – 500 exemplaires seulement – diamètre 50 mm – prix observé 400 euros. Image Power Coin. 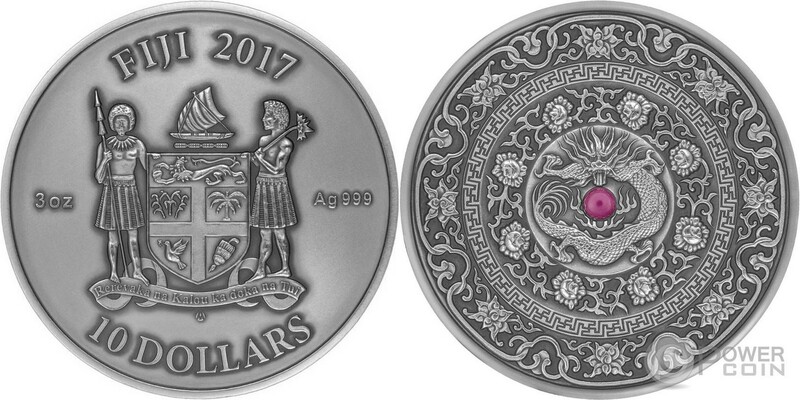 FIJI 10 Dollars 2017 – Mandala Art : Chinese Dragon – 3 oz 0.999 silver antique finish (with Ruby insert) – mintage 500 pcs only – diameter 50 mm – observed price $432. FINLANDE 10 Euro 2017 – Mères – 10 g Argent 500 Proof – 10 000 exemplaires (dont 100 numérotées) – diamètre 28,5 mm – prix 38 euros. 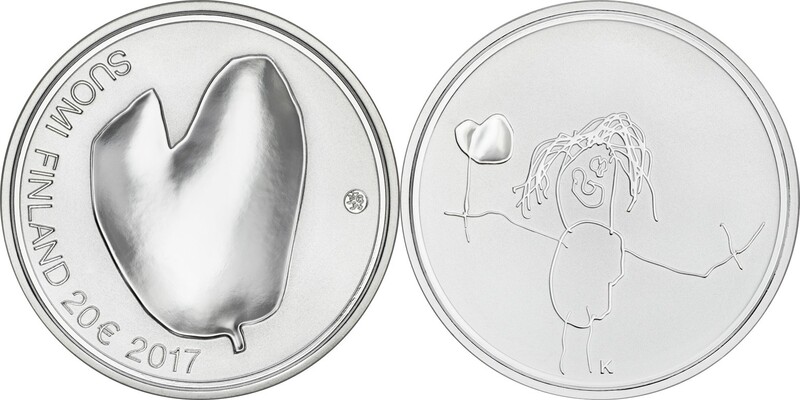 FINLAND 10 Euro 2017 – Mothers – 10 g 0.500 silver Proof – mintage 10,000 (including 100 numbered) – diameter 28.5 mm – price $41. FINLANDE 20 Euro 2017 – Mères – 25,5 g Argent 925 Proof – 5000 exemplaires (dont 100 numérotées) – diameter 38,6 mm – prix 61 euros. FINLAND 20 Euro 2017 – Mothers – 25.5 g 0.925 silver Proof – mintage 5,000 (including 100 numbered) – diameter 38.6 mm – price $66. LETTONIE 5 Euro 2017 – Le gant du vieil homme – 31,47 g Argent 925 Proof- 10 000 exemplaires – diamètre 38,61 mm – prix 47 euros. 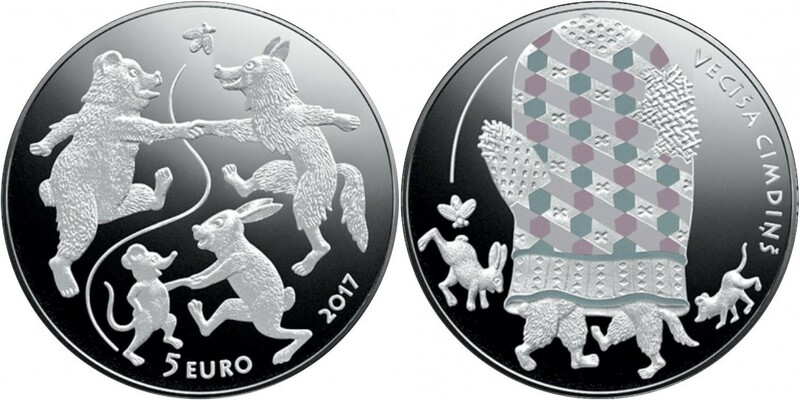 LATVIA 5 Euro 2017 – The Old Man’s Mitten – 31.47 g 0.925 silver Proof – mintage 10,000 – diameter 38.61 mm – price $51. FRANCE 10 Euro 2017 – Catherine de Médicis – 22,2 g Argent 900 Proof – 5000 exemplaires – diamètre 37 mm – prix 55 euros. FRANCE 10 Euro 2017 – Catherine de Medicis – 22.2 g 0.900 silver Proof – mintage 5,000 – diameter 37 mm – price $60. CANADA 5 Dollars 2017 – Maple Leaf : OVNI – 31,1 g Argent 999 BU (plaqué ruthenium noir et fluorescente) – 500 exemplaires seulement – diamètre 38 mm – prix observé 79,95 euros. Images Munzdachs. 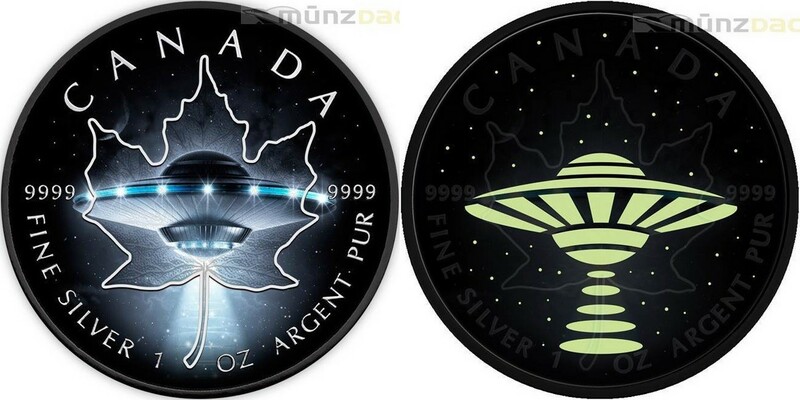 CANADA 5 Dollars 2017 – Maple Leaf : UFO – 1 oz 0.999 silver BU (Black Ruthenum plated, glow-in-the-dark coin) – mintage 500 pcs only – diameter 38 mm – observed price $87. Pictures Munzdachs. AUSTRALIE 3 x 50 Cents 2017 – Esprit Anzac 100ème anniversaire – 3 x 15,55 g Argent 999 Proof – 5000 exemplaires – diamètre 32,6 mm – prix du set 122 euros. AUSTRALIA 3 x 50 Cents 2017 – The Anzac Spirit 100th anniversary – 3 x ½ oz 0.999 silver Proof – mintage 5,000 – diameter 32.6 mm – set price $131. TUVALU 2 Dollars 2017 – Dragon – 62,21 g Argent 999 finition antique – 1000 exemplaires – diamètre 40,5 mm – prix 141 euros. Images Power Coin. 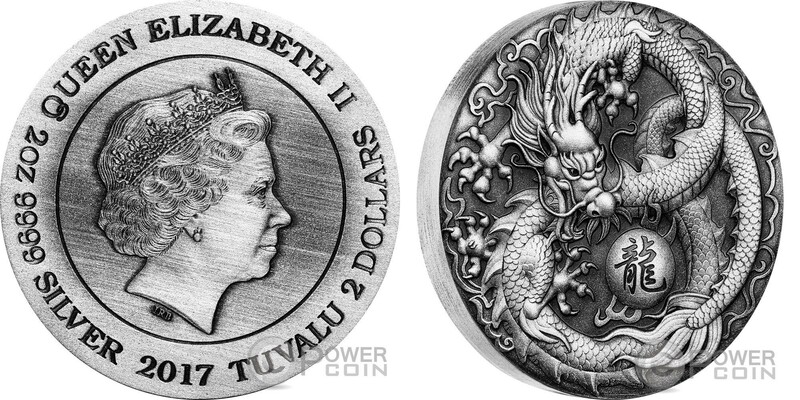 TUVALU 2 Dollars 2017 – Dragon – 2 oz 0.999 silver antique finish – mintage 1,000 – diameter 40.5 mm – price $152. Pictures Power Coin. TUVALU 50 Cents 2017 – Bébés polaires : pingouin empereur – 15,55 g Argent 999 Proof – 5000 exemplaires – diamètre 32,6 mm – prix 42 euros. Images Power Coin. 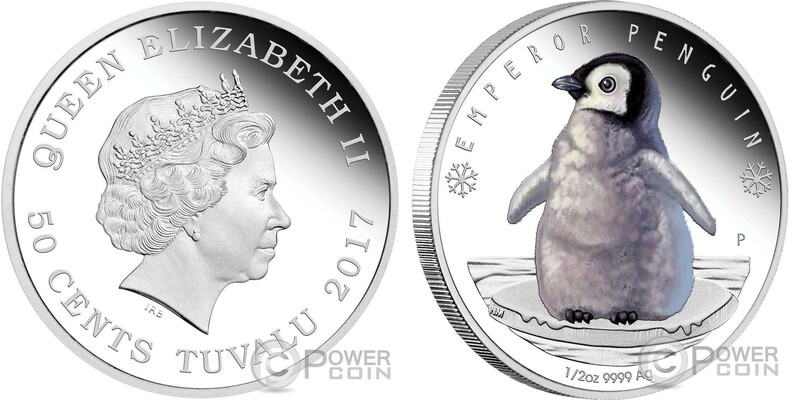 TUVALU 50 Cents 2017 – Polar Babies : Emperor Penguin – ½ oz 0.999 silver Proof – mintage 5,000 – diameter 32.6 mm – price $45. Pictures Power Coin. 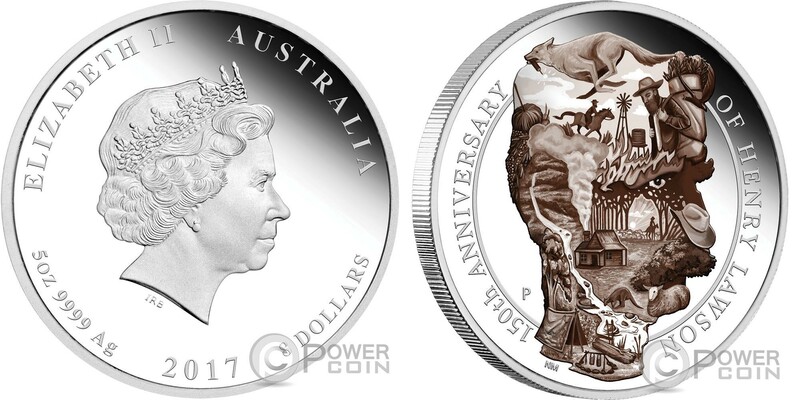 AUSTRALIE 8 Dollars 2017 – 150ème anniversaire de Henry Lawson – 155,53 g Argent 999 Proof – 250 exemplaires seulement – diamètre 60,6 mm – prix 323 euros. Images Power Coin. AUSTRALIA 8 Dollars 2017 – Henry Lawson 150th anniversary – 155.53 g 0.999 silver Proof – mintage 250 pcs only – diameter 60.6 mm – price $347. Pictures Power Coin. GRECE 10 Euro 2017 – Age du fer et du verre – 31,1 g Argent 925 Proof-like – 5000 exemplaires – diamètre 38,61 mm – prix 60 euros. GREECE 10 Euro 2017 – The Age of Iron & Glass – 31.1 g 0.925 silver Proof-like – mintage 5,000 – diameter 38.61 mm – price $65. 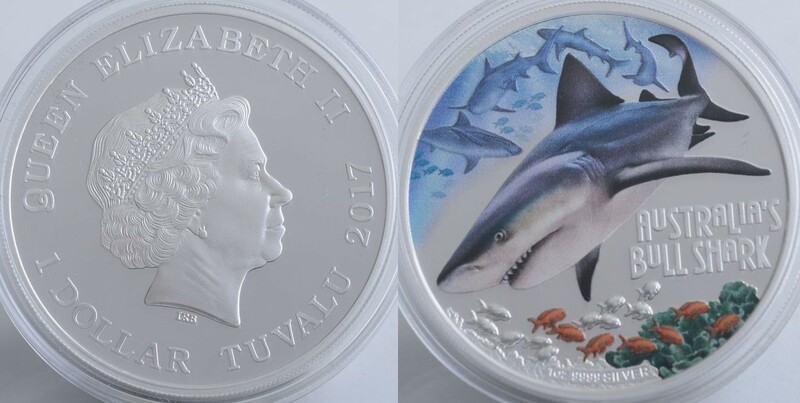 TUVALU 1 Dollar 2017 – Requin taureau australien – 31,13 g Argent 999 Proof – 5000 exemplaires – diamètre 40,6 mm – prix observé 70 euros. TUVALU 1 Dollar 2017 – Australia’s Bullshark – 1 oz 0.999 silver Proof – mintage 5,000 – diameter 40.6mm – observed price $76.